President Michael D. Higgins and his wife Sabina visiting Trócaire’s Gold medla winning garden to speak with designer Barry Kavanagh and Trócaire’s Katie Bolger. Pic: Courtesy Trócaire. ‘Resistance: a Garden for Trócaire’ has won Gold in the medium-size Concept Garden category at Bloom 2018. News of the prestigious win was announced on Tuesday. Trócaire’s garden of resistance sought to portray the stories of some of those courageous people the Church’s overseas development agency works with and who speak-up in defence of people, land and the environment. The garden, which was designed by Barry Kavanagh, was broken up into three areas of geographical representation: Palestine, Guatemala and Zimbabwe. Each section represents how human rights defenders in those countries are risking their lives and safety to stand up for people and communities threatened with eviction, exploitation and violence. The Zimbabwe section illustrated a water resource being polluted by a mining company, while the Guatemala area was dominated by a scorched piece of land to represent how indigenous communities are evicted to make way for private businesses. 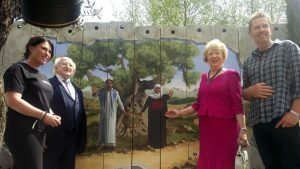 The Palestine section featured a stunning mural by Ciaran ‘Yohan’ Brennan of an Israeli man and Palestinian woman standing together to protect an olive tree, a symbol of peace in the region. The garden was surrounded by Irish plants, representing people in Ireland embracing the people who are at the forefront of the struggle for justice in Palestine, Guatemala and Zimbabwe. A digital screen depicted those who have lost their lives while defending both human and environmental rights. Bloom is Ireland’s premier gardening festival; it was launched by Bord Bia in 2007 primarily as a promotional vehicle for horticulture. This year’s event ended on Tuesday and the winners were then announced. Barry Kavanagh is from Bailieborough in Co Cavan and he teaches horticulture and design with the Cavan-Monaghan Education Training Board. He also founded a social enterprise called Nature’s PATCH Network Ltd in 2015 which provides services to community groups for the formation of landscape and biodiversity plans for towns and villages. After designing two postcard gardens at Bloom in 2013 and 2014, he was commissioned to create a show garden in 2016. This garden ‘Across Boundaries’ which conveyed how social farming can play a vital role in the therapy of participants within the healthcare system, received a Gold Medal and both the People’s and Designer’s Choice Awards.